When you install any version of the 4.9 branch, be aware that this is a quite new branch and you have to perform a clean install (remove all your datas and settings). Therefore I recommend you to have a passport account in order to be able to retrieve your data after the installation. Some features are temporarily disabled : status bar, search bar,cloud, switching tabs, night mode... and may or may not return in the future. Don't tweak your settings (ie make sure "customize useragent string" is unchecked) unless you know what you are doing and only if you encounter an issue with some site. If you change your user agent keep in mind that some websites may not display fine, in that case revert to default UA. Add extensions one after the other. 1.Scrolling through pretty much every internet site was totally unsmooth,it was hooking. 2.Settings like "Use Retromodus as Standard (Just possible with IE8 or higher)" didnt apply when changed.Well,it seemed to have applied,but the next time I`ve opened my internet,the setting was always turned to off again. 4.The missing cloud...I wonder why Maxthon did this step back in the wrong direction.In the sidebar I could login to my Maxthon Passport normally,and in the Menu tab I was online too,as long as I have not closed the internet.After closing and re-open Maxthon,I was still logged in into my account in the Maxthon sidebar,but in the menu it was just trying to log in the whole time without success.Online time did not matter,it could not achieve to log in,but it kept trying,which of course is just one more process which slows the PC and the internet down. 5.Internet sites needed way more time to build up,especially those with many pictures (Youtube and Stuff like this).But normal sites like Google needed more time as well. 6.Closing the internet while downloading something: Maxthon 4.4 version is smart enough not to close the internet while downloading something,it just minimizes into the system tray when you close Maxthon with the "x" . But Maxthon 4.9. is too dumb for that,it gives you a warning message that you are downloading something and if you are sure to close.If you click "yes" , your downloads are gone,and if you click "No" ,the internet doesnt do anything in terms of minimizing into system tray.Therefore you have to set the "Minimize Maxthon into System tray when closing" option in the settings.But as this applies also when not downloading something it is just a semi-optimistic way of solving that problem. I use Maxthon now since more than 6 years and was always satisfied with it,recommended it to many friends of me and nearly every update brought positive changes.But this one was a big step back in the wrong direction.Someone could mean that at least the Adblock was updated,as with the time more and more advertise found out how to break through adblock,but this wasn`t the case either.So I dont really have one positive thing to say to Version 4.9.1.1000. I hope the developers will built on the things that Maxthon truly differencies from other Browsers in the future again. PS: If you think it was the wrong topic to mention all of this,it would be nice if you move it there,where it can provide informations to the developers and/or other users.I really made my thoughts on this to provide the best feedback possible,and also it was much to write . So please dont delete it because it is in the wrong topic (if it is). Actually on the contrary, the cloud feature will be greatly improved. But current implementation of the cloud feature is not good enough, so we need to take them back and will release a revamped version in mx5. How on earth does Maxthon release an 'ordinary stable version' with "current implementation of the cloud feature is not good enough". Reading this post reveals lots of problem with this release besides the cloud feature. It looks like Maxthon have not tested the version at all and was for some reason rushing out to release it to the public. This is very very unprofessional! I would take this release quickly from the download area if I were you guys. It's a pitty I installed this version before reading this post. the night mode is essential, please don't kill it! and w/e switching tabs means, anything related to switching from one tab to another is just perfect right now, keep it that way. I don't know why this new version is getting so much hate? I'm all up for change & very happy that you guys switched to the Chromium engine..
As much as I dislike Google..this engine is the future for web development..Mozilla has lost the plot, WebKit is just about okay & Microsoft is just well Microsoft! Seriously basic sites had a big problem with the old Trident engine..
eg. site like Fudzilla wouldn't load the comment section no matter what! With 4.9 branch I have no problems..all sites are working perfectly. I don't know why others are facing issues.. I don't even have any problems with flash!! I updated the flash player as described in the post & all is normal.. I just want to say THANK-YOU for such a nice implementation of flash..just copy the .dll file & your done no more messy installer no registry edit..Nothing. No non-sense or annoying pop-ups to update or other blah! Flash player should be avoided like the plague in the first place but this is the PERFECT implementation of it in ANY browser. eg. the speed dial takes a while to load even on SSD & i7 processor..new tabs open with 1 second pause sometimes...the download icon is not visible anymore you have to click the Menu to open it..The mute sound button now only shows up next to tabs there is no way to mute the entire browser like before..ad block is detected by some sites..option to disable flash like Edge browser..usage of the latest Chromium engines..but all such are minor annoyances & I'm sure all these will be fixed in future versions! The best thing I love about Maxthon is the auto sync - Notes tab, User agent changer, in built ad block..and so much more! To me this is just the perfect browser now..before I was facing some issues coz of the browser engine but now I have just no reasons to use any other browser! Maxthon 3 used webkit which is not the trident engine as the engine for ultra mode, M4 used chromium based blink engine. Your OS version of trident is used in retro mode. M4.9 uses version 39 of blink as will newer versions of 4.9 and 5.0. The plan is to update blink every few months. D/load butoon is available from the menu and the sidebar, no idea if there are plans to add it to the tool menu. The mouse gesture left/up is the default gesture for mute. Of course you can set what ever gesture you want for it. Just something to think about. Why removed the Properties menu pictures ??? How now to find out the size of the image? This is important! I actually hadn't noticed much of a difference. What i don't like in 4.9 is the Page Zoom drop down menu. in 4.4 i can manualy type any value and now this new drop down menu is taking that away, replacing it with default values with steps getting bigger and bigger. 125% jumps right to 150% zoom. WTF? I need 98% for my laptop, and 115% for my PC. I want to be able to insert custom values. I hate it when developers change things in ways which deprive us of choices we've had before. This is what Microsoft constantly does with windows settings and customizations. 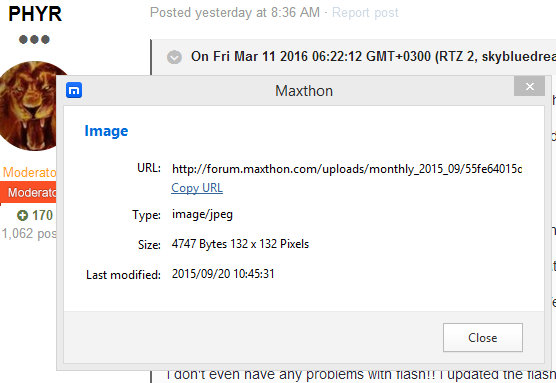 I hope Maxthon isn't going in the same direction. There really isn't any alternative to it. And probably more that I can't remember. 4.9 is not ready to be used by anyone other than beta testers. Get that download OFF of the front page. Feature regressions of any kind are NOT acceptable. Maxthon seems to screw this up with every major release. It's amateur. You'll never retain users if you keep making them angry like this. Version 4.9 - for me after the last update Maxton died. Sorry for the inconvenience. May we know specifically what happened? The browser can't start or something else? Did you perform a clean install?